This Peach and Fresh Pineapple Green Smoothie recipe has been a lifesaver! I was beginning to resemble a little barrel and, as the warm weather began rolling around this spring and this girl started trying on summer clothes, well, let’s just say, I wasn’t happy. Nothing fit right and it made me mad. Okay, I am getting older, and it’s true that metabolism does slow down a bit as you age, but you know what? I don’t think that’s my problem. I just really enjoy eating good food. I suppose you kind of figured that out, since I have a food blog, right? So I set up a little action plan for myself, eating leaner and healthier, limiting portion sizes and sweets, drinking lots of water (my kids call me a “camel”, cause I’m horrible at remembering to hydrate) and getting more exercise. Scott was in the same boat (weight-wise), and he agreed to join “the party”. We started out with short distances on our bicycles and have increased a little each day. This morning, I biked with a friend and tipped the odometer at just a hair over 18 miles. Woohoo! I still have a way to go, but my clothes are definitely fitting better. One little trick I always employ, when we’re trying to shed a few pounds, is to keep things interesting by substituting a smoothie occasionally, in lieu of a traditional breakfast. They’re easy, quick and supply lots of energy and nutrients. I love green smoothies, as they’re not only loaded with sweet, juicy fruit, but they’re a great way to get those dark leafy greens into your diet in a super delicious way. 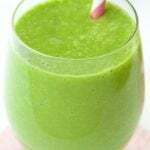 The fruit flavors shine in a green smoothie, and yet you gain lots of wonderful vitamins and minerals from the greens. A win-win for sure! I also like to make sure there’s plenty of protein in my smoothies, so we’re not hungry an hour later. I’ve tried different options for protein, this time deciding on Greek yogurt. Fresh peaches, pineapple and a super ripe banana are the other star players in this Peach and Fresh Pineapple Green Smoothie, and a bit of fresh ginger and coconut extract add lots of flavor. Even if you’re not feeling “barrel-ish” like I was, be sure to put this delicious Peach and Fresh Pineapple Green Smoothie in your breakfast rotation. It will keep you satisfied for hours, and it’s simply a super fun way to start the day! 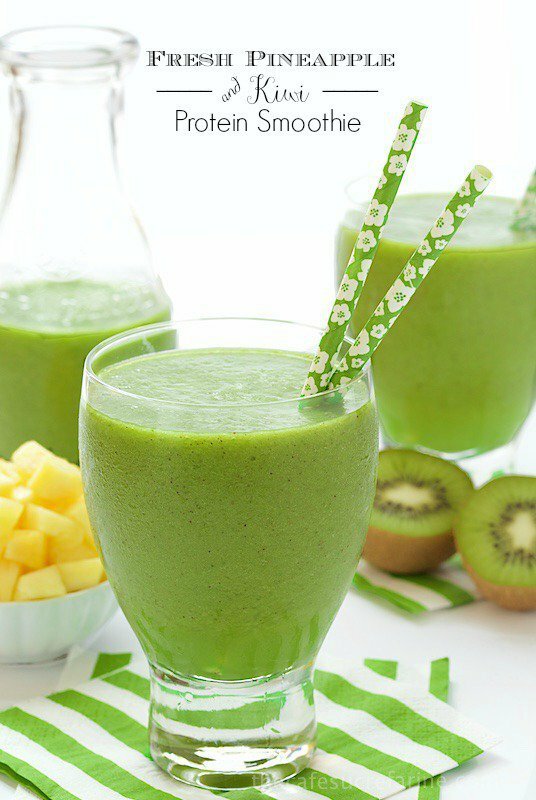 This Peach and Fresh Pineapple Green Smoothie is a great way to lose weight and a super healthy and delicious way to start the day! 2 medium peaches unpeeled, pitted and halved. Starting with the coconut milk (this will make it easier to blend), place all ingredients, except ice, in a blender container. Blend on high for a few minutes until all ingredients are incorporated and mixture is smooth. Add crushed ice and blend for another minute. Pour into tall glasses and enjoy! To make things easier in the morning, you could make these the night before. Just omit the ice and refrigerate right in the blender container. In the morning just add ice and you'll be ready to roll! I’m considering putting all of these in rotation for the next several months! There are many great things about having a food blog Chris but the food tasting and sitting on one’s bum to write and edit photos certainly does take it’s toll doesn’t it?! Bravo for you taking on turning that around. And having your husband as a biking buddy I’m sure makes it easier and more fun too! I need to jumpstart on the smoothie front myself. All my greens have been going into salads instead of the blender. Need to change that! Dear Chris, these are some of the prettiest most appealing smoothies I have seen in a long time – and the photos are so very elegant too – you are quite the recipe developer and I have so much respect for all the things you do, including those long daily bike rides! Just fabulous! Thanks Andrea! You are always a great encourager! Ok, Chris, if you say so but I might have a problem getting past the “green”.Maybe the strawberry protein smoothie is more my style. You really hit the nail on the head about meshing food blogging and aging and watching the pounds. Before I read this, I was in the kitchen cutting up all my veggies for the week. Only if I have everything “on the ready” can I eat well. I have noticed that you two are biking every day and, just this afternoon, a friend and I made plans to get back on the bike. We have great bike paths up here and I needed your inspiration and her willingness. I DO hope this smoothies fill me up so I am not hungry two miles into the bike ride! I am counting on you. I think you’ll be quite surprised Mary regarding the green smoothies. Biking is so fun as long as you don’t start in too aggressively, just a bit further each day. We’re up to 21 miles now and that’s about as far as I want to go. You’re so smart to plan ahead with healthy eating, it really does make a huge difference! Good for you on taking some awesome steps to feel less “barrel-ish”, Chris! Thanks Shashi. I’m getting there, slowly but very surely! These sound luscious! And look pretty too! A perfect afternoon snack! First of all, kudos on your biking exercise routine! My husband and I just gave away our old bikes in favor of walking but it’s such a fun way to get out and get trim 🙂 I love smoothies and have one several times a week but I have to say I’m in a rut and could branch out a little bit with flavors. Love this! Hi Susan, we love walking too. I guess getting out and moving is what matters however you like to do it! Thanks Jennifer! I totally agree, I feel so heathy and energized after drinking a green smoothie. Hi Chris, my husband and I had/have a similar problem and are working to keep smaller portions. Both smoothies look wonderful, not sure how I missed the one before. Pinned both. Hi Cheri, wishing you success! Thanks so much! I love a great smoothie and yours sounds fantastic! Love the photos too. I just had one today with lime yogurt, frozen pineapple and a bit of grapefruit juice – quite tasty. Hope you are doing well! Thanks so much. Ooh, that smoothie sounds wonderful Lisa! I have not been a smoothie person up til now, but I am trying to get into it. You guys make this one look so tempting – the color alone has me convinced. I love the overhead closeup! This is the prettiest smoothie ever! Love the flavor combination – delicious! Thanks so much Tricia, I love that vibrant green color. This is one very healthy and low calorie smoothie. I love that strawberry smoothie too, Chris. Thanks Angie, the strawberry one is like a shake, but much better for you!